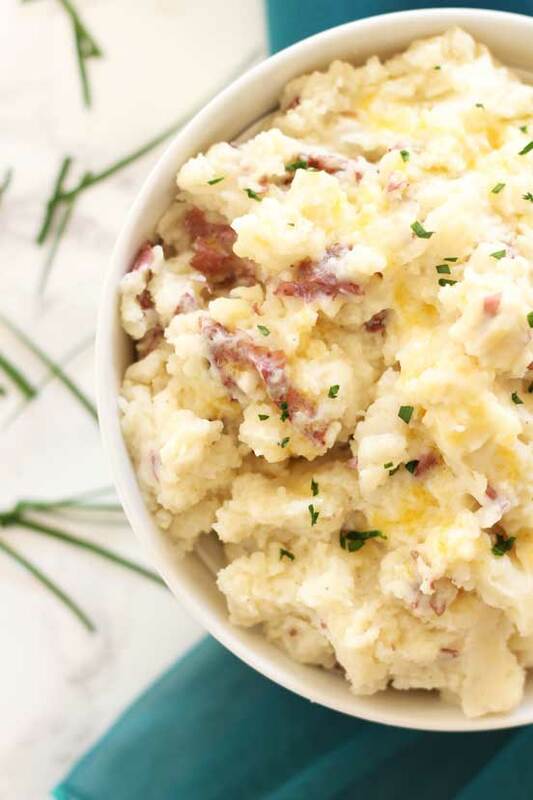 This homemade mashed potatoes recipe is so easy and oh so good! This side dish is full of flavor and perfect for your holiday season! These take no time at all to whip up and your family will love these potatoes! 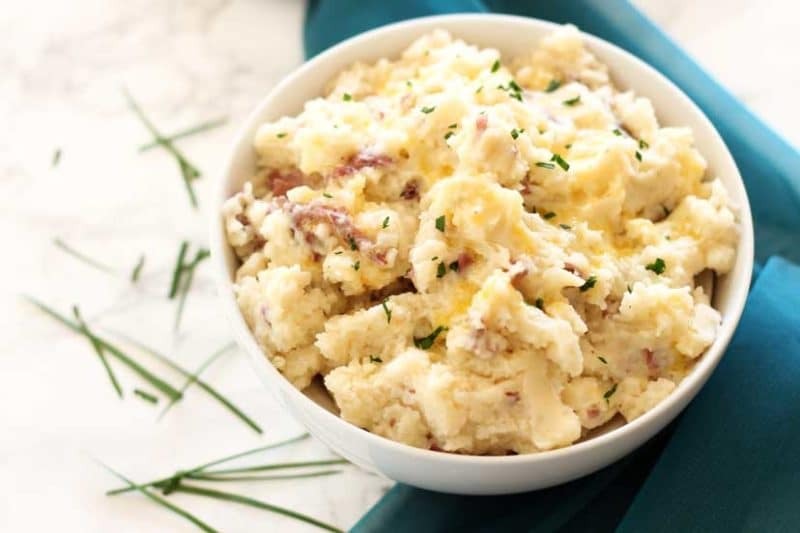 These mashed potatoes pair so perfectly with so many weeknight meals, but you’ll also enjoy them during them holiday season! Happy Thanksgiving everyone! I’m so excited that Thanksgiving is this week! Thanksgiving is a time for thanks. It’s a time for reflection. It’s a time for rest. And oh my goodness it’s a time for FOOD FOOD FOOD! I so enjoy good food….gosh who doesn’t? And I just love getting creative with recipes! As ya’ll know, I love cooking and I love to eat! Like most families, we have a tradition here in the Mason household on Thanksgiving. And I don’t cook for Thanksgiving…I know, can you believe it? The girl who is all about food and has a food blog and who caters doesn’t cook for Thanksgiving? Nope, I don’t cook for Thanksgiving, but I do cook for Christmas! 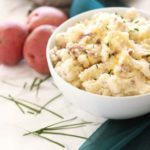 I feed about 80 family members on Christmas Eve night and this homemade mashed potato recipe is a family tradition for that Christmas meal. But Thanksgiving is this week so let’s focus on that for a minute. As I sit here writing this post, I’m thinking about what everyone else does for their family traditions. As for ours, I get up and run a 5k at our community turkey trot. It just makes me feel better to get all that running in before I literally stuff my face all afternoon and all night long. And I do…I eat non-stop during the holidays! Because you should! The holidays only comes once a year! Then after I run, we get cleaned up and we drive about an hour to my sister-in-law’s house for an afternoon of Thanksgiving food, family fun, games, basketball, football and fellowship! It’s so much fun! Then we come home as the sun starts to set, we sleep for a couple of hours then get up at 1am to go Black Friday shopping! Yep – I’m one of those! Last year around this time my husband had surgery and was still recovering so we are skipping the Black Friday shopping. But to be honest, it’s really not about shopping at all. It’s about a never ending date night on Black Friday. So last year we sat at home so he cold rest. And let’s be honest…I needed to rest myself. This recipe is crazy simple. My mom has been making these mashed potatoes since I was a baby and I’ve kept the recipe and tradition going for my family. I make these mashed potatoes for my family at least two times a week. That’s how easy they are to make. They pair perfectly with everything and they also fit right in with any holiday meal! Thanksgiving, Christmas, Easter, New Years Day…you name it! They just go with everything…like my Lemon Butter Chicken, Crock Pot Roasted Garlic Herbed Chicken and my Baked Chicken with Dijon Lime Sauce. The key to keeping some nutritional value in these mashed potatoes is leaving the skins on and not peeling the new red potatoes. Oh – and I only use new red potatoes when I make mashed potatoes because they are less starchy than Idaho potatoes. The new red potatoes will give you more of a velvety and smooth texture. They’re just perfect when you mash them! This recipe contains five super simple ingredients that everyone probably has in their kitchen: new red potatoes, salt, pepper, milk and butter. I typically use margarine, but if you use butter, use salted butter. Here’s how I make this recipe. I dice my potatoes with the skin on and boil them until they are soft. I do the fork test where I pull one potato out of the pot of boiling water and if my fork goes through it smoothly, I know it’s done. Then I drain them in my strainer and pour the potatoes in a big howl. I then add in my margarine, milk, salt and pepper. From there, I use my hand mixer to whip these potatoes up. If you don’t have a hand mixer, it’s ok you can whip these up with a whisk, a fork or an old fashioned hand masher. But I do love using my hand mixer because I can get the velvety texture! This recipe is naturally Gluten Free, so everyone can enjoy this dish! And that’s all there is to this recipe! So super simple but oh my goodness so tasty and full of flavor! Have a fantastic Thanksgiving you guys and enjoy all that yummy food! Happy Eats on this fantastic turkey day! This homemade mashed potatoes recipe is so easy and oh so good! This side dish is full of flavor and perfect for your holiday season! 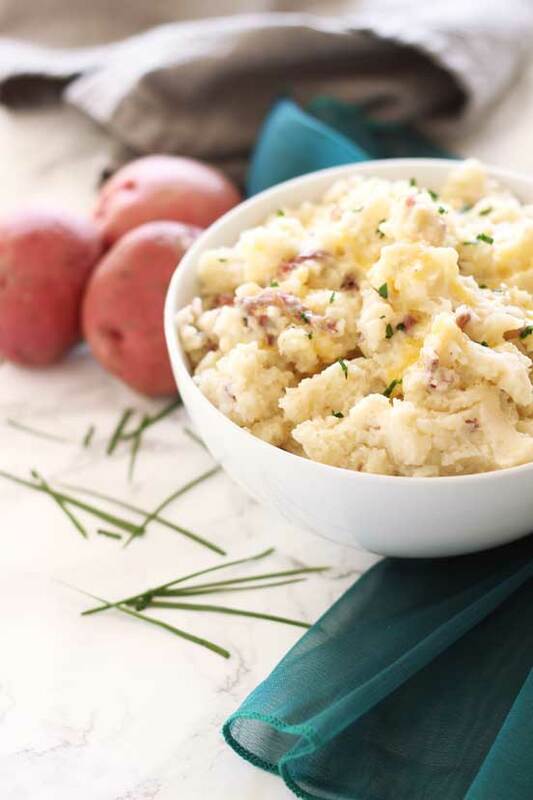 These perfect homemade mash potatoes will take you no time to whip up and your family will love these potatoes! These pair so perfectly with so many weeknight meals, but you'll also enjoy them during your holiday season! Take all 8 of the New Red Potatoes and dice them into chunks. Make sure you leave the peel on the potatoes. Once diced, rinse the potatoes in the strainer to get all the dirt off and then add to a large pot. Fill the large pot with water so that the potatoes are completely covered. You'll want to make sure there is a full inch of water over the potatoes so they have room to boil. Set the large pot of potatoes on the stovetop and bring to a boil. Let the potatoes boil for about 15 to 20 minutes, just until the potatoes are done. Once the potatoes are done, strain the water from the potatoes to drain. Move the drained potatoes to a large bowl. Add in the margarine, milk, salt and pepper and mix with a hand mixer until smooth and velvety. You may need to add in a bit more milk to ensure your potatoes are wet enough to mix. Once the potatoes are whipped up, add any additional salt and pepper to taste. Don’t Forget!! 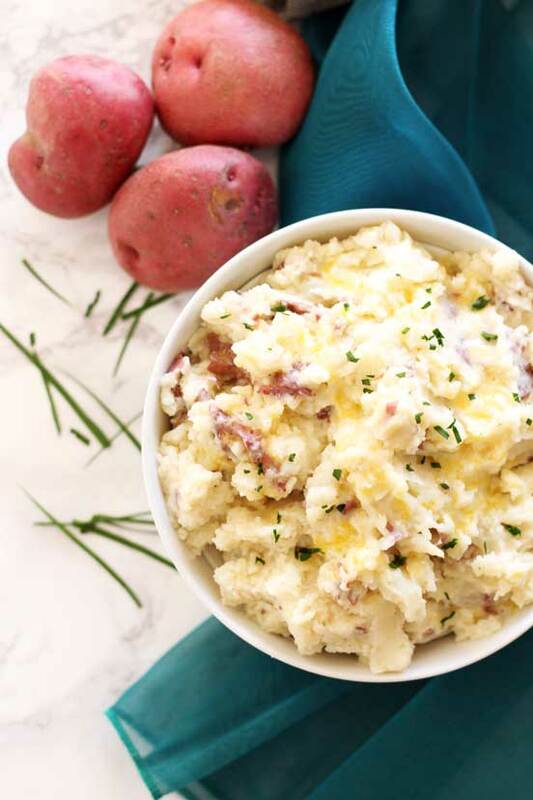 Pin these Homemade Mashed Potatoes to your Side Dish, Gluten Free or Holiday board on Pinterest! I have the perfect salted grassfed butter that is sitting in my freezer waiting for this recipe. It look so tempting even without any gravy, and you know that ‘s the sign of perfect mashed potatoes. That butter sounds delish!! yeah these potatoes dont need any gravy…they are perfect without! But gravy is always really yummy though! Aaaaaah, the great potato debate: smooth and velvety or mashed with lumps? My husband’s family is all about whipping the potatoes until they’re so smooth, you could practically drink them with a straw. Personally, I like mine lumpy and bumpy. The flavor is always great either way, though! To be honest, I love both and I switch it up every once in awhile to break up the norm and provide some variety!! It always melts my heart hearing about Thanksgiving traditions and how the recipes are shared in the family from generation to generation . Any yeah, from now on I will be making mashed potatoes only with red potatoes! Good tip! It’s the secret to a successful batch of mashed potatoes! I’ll never use anything different again! You feed EIGHTY family members on x-mas eve night… out of a home kitchen? You have some serious patience. 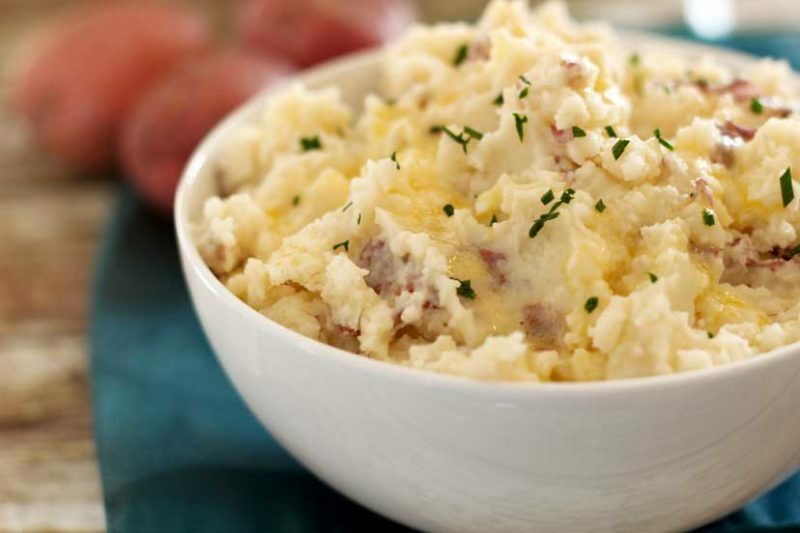 And I love my family, but that is a lot of people to feed for a ‘day off.’ Mashed taters are one of my absolute favorite dishes and this looks great. I am gonna make this for Turkey day. I know…it’s insane! But in a good way! I love to cook and I cater for many more when I do catering jobs so no biggie!